If there’s one thing I’m a sucker for, it’s performance art. The weirder, the better. One of my favorite festivals in Portland is the TBA (Time-Based Art) Festival that happens every September. I’ve seen women do quick changes on a trapeeze, a man lip sync an entire Beyonce album and show where they gave everyone in the audience a Viewmaster while the audio was performed live on stage. But performance art doens’t have to be weird. Sometimes it’s as simple as putting a common item, in an unusual. That’s way I was so excited when I heard about “Piano! 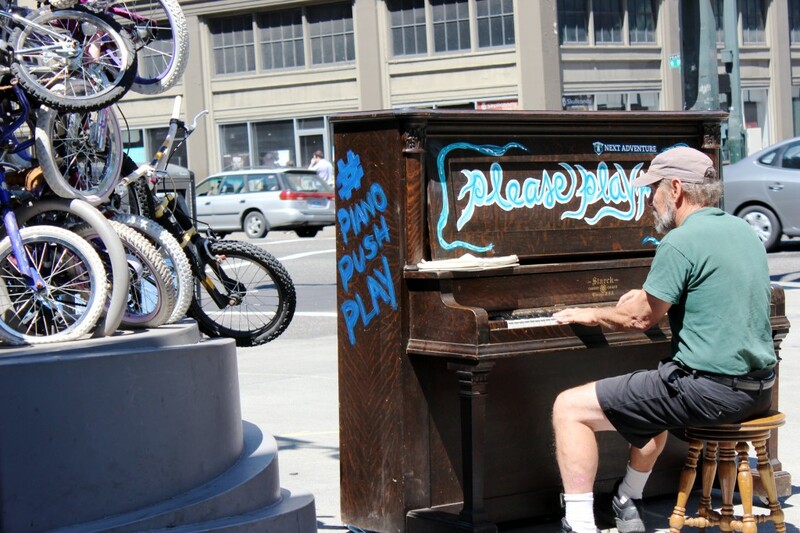 Push Play!” a pop-up experience happening in Portland through August 2nd. 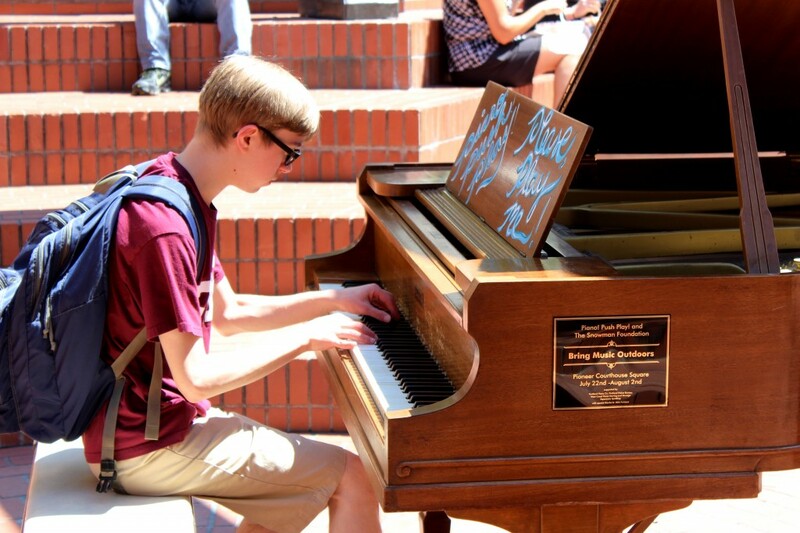 Quite simply, they’ve put pianos in 4 very public downtown locations, inviting anyone to play. I had last Friday off, so I decided to go on a tour of all four locations. Accompanied by my dog, Spike, we hit the streets of Portland on a 2-mile loop of the four locations. First stop, 13th and West Burnside. The piano was right on the corner in front of American Apparel and there was a man playing! It was pretty cool. A couple people were standing around to listen, but mostly it was just a nice moment for pedestrians as they walked past. 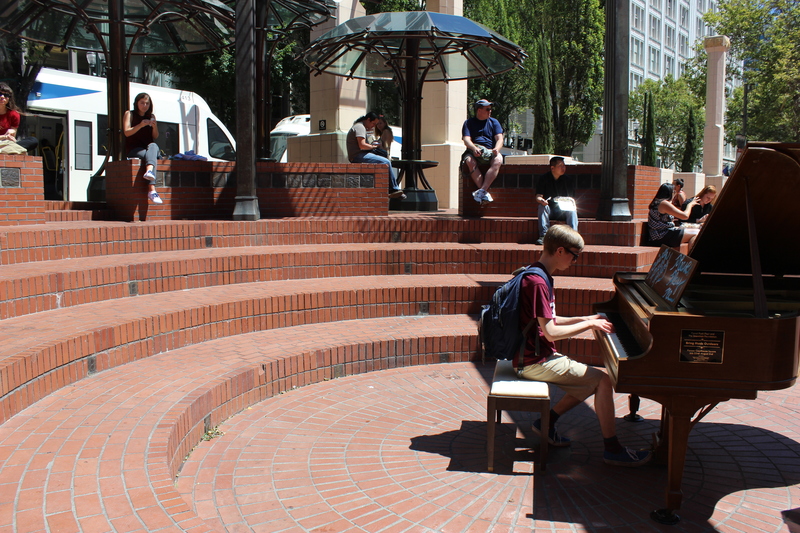 Next stop: Pioneer Courthouse Square. Someone had just finished when we arrived, so I was worried we’d missed our chance to see someone play. Spike needed a rest, so we sat for a few minutes next to the piano and waited. Sure enough, young guy, perhaps you could even call him a kid, timidly walked up to the piano and sat down. Afer adjusting his seat, he began playing a beautiful classical song. I think it was Bethoven, but I’m not exactly sure. It was really impressive. It was just about lunch time so there were lots of people listening and milling around. Exactly what this pop-up experiment intended. I bet it’s really neat to play in this spot. Have you ever been there? If not, you really need to check it out next time you’re in the square. The little amphetheaer in Pioneer Courthouse Square is designed as an echo chamber. It only works if you stand on the circle in the middle and speak. It’s totally crazy. To your ear, it sounds like you’re speaking into a microphone. To everyone else, you sound normal. So I bet it’s really cool for the piano players, as they sit in the middle of that circle and play. Next stop: Salmon Springs Fountain. I was really looking forward to this spot, but ended up very disappointed. 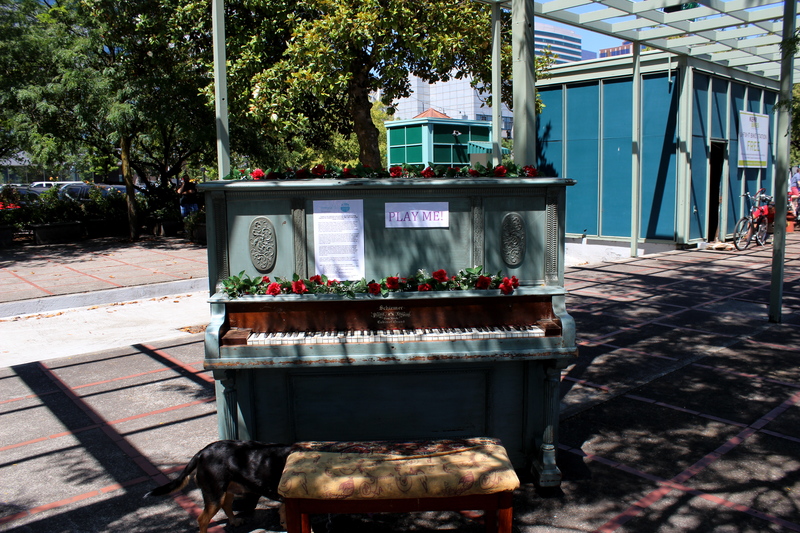 The piano was supposed to be right next to the fountain… near all the kids, bikes and pedestrians, but it was no where to be seen. After looking around for a bit, I finally found it, way back behind the Rose Festival Building. It was hard to see and of course no one was playing. Boo! So lame, and things were about to get even lamer. 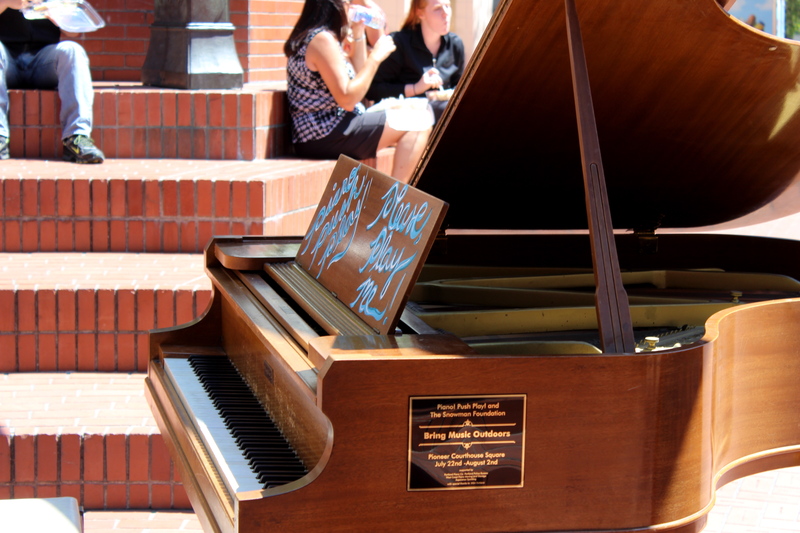 The next piano was supposed to be at Saturday Market, near the new Bill Naito Legacy Fountain. But again… I couldn’t find it! I looked around on all sides of the market, but I saw nothing. I was hot, frustrated and disappointed. The first two stops had been so cool, and the final two, nothing. Spike and I took a break in the shade, then started out long walk back to the car. Overall, a really cool idea. I hope they try it again next summer, perhaps at different spots. Maybe the waterfront, just wan’t a good place for something like this. I’d like to see it on the bus mall, at a max stop, or maybe under that weird art across the street from Powells. Even next to Voodoo Donuts (captive audience). It’s surprising, enchanting and memorable for any one, whether a tourist or a native, who passes by. 3 Comments on Piano! Push Play! I’m sorry to hear about the other 2 locations being more hidden away. 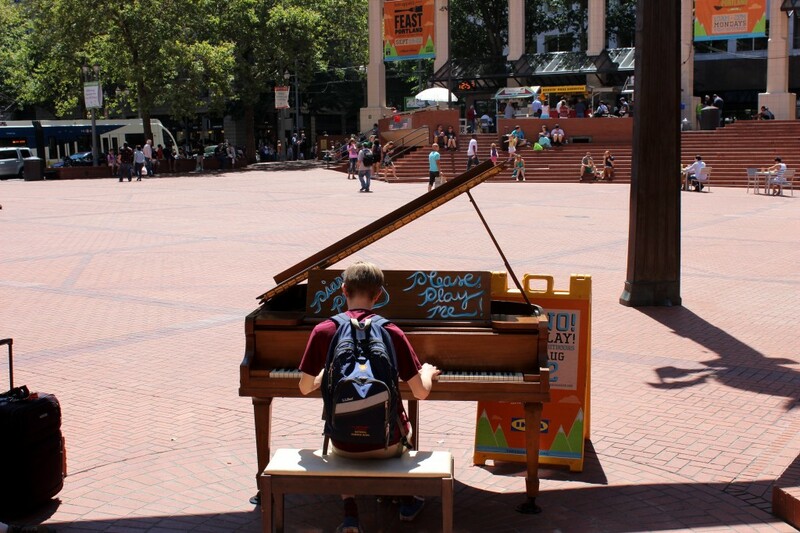 I saw the piano at Pioneer Square riding on the Max and was curious about it, but it was only last week that I happened to take lunch from the food cart and visit. I was blown away by all the people with talent out there sharing music. I really liked that location as there was quite a crowd (I couldn’t even get my group of fellow-lunchers to fit to listen, we had to go across the square). Hopefully they will continue this next summer, as it seems simple but so enriching to the public. This project is still happening and has a piano at the Art Museum and it will be there through August. It’s lovely and set up again a really beautiful tree. 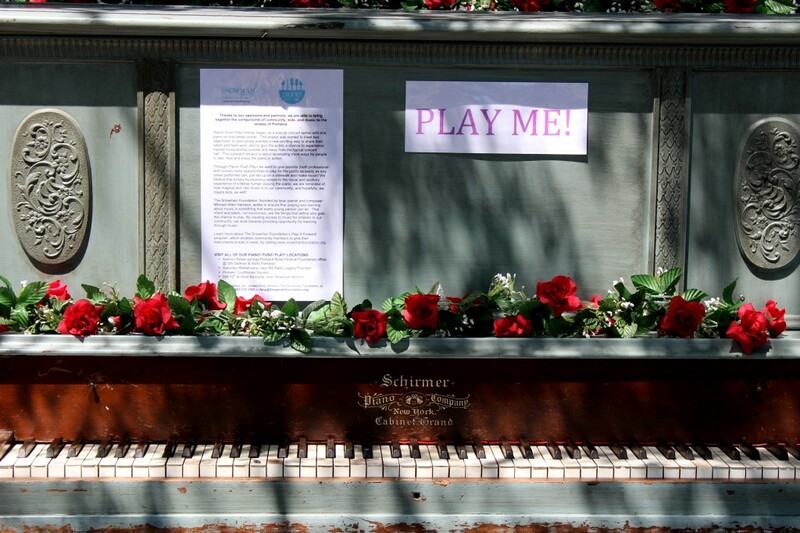 This project is still happening and has a piano at the Art Museum and it will be there through August.